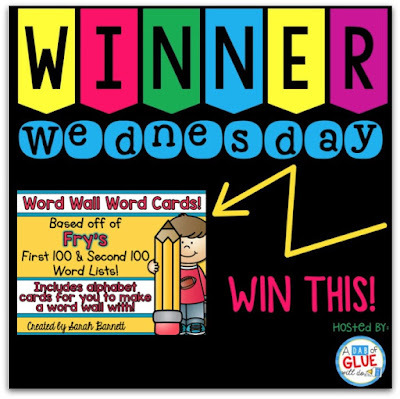 I am SO excited to be linking up with my friend Jennifer from A Dab of Glue Will Do for Winner Wednesday! Winner Wednesday is the first Wednesday of every month. I will pick a popular product from my store, explain all about it and then you can enter to win it! To enter, all you have to do is submit your name. Super easy! This week I am giving away one of my newer products, my Word Wall Word Cards! 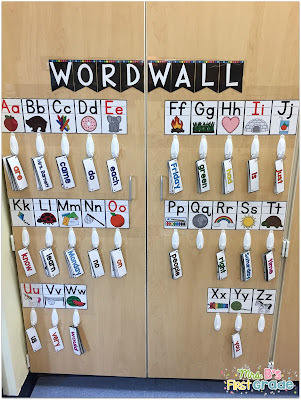 In my previous years teaching I have had my word wall on my back closet and I tapped each word as we learned it to the wall. By the end of the year that wall had so many words on it you had trouble finding what you needed and it just looked like a hot mess! This year I decided to organize it differently. 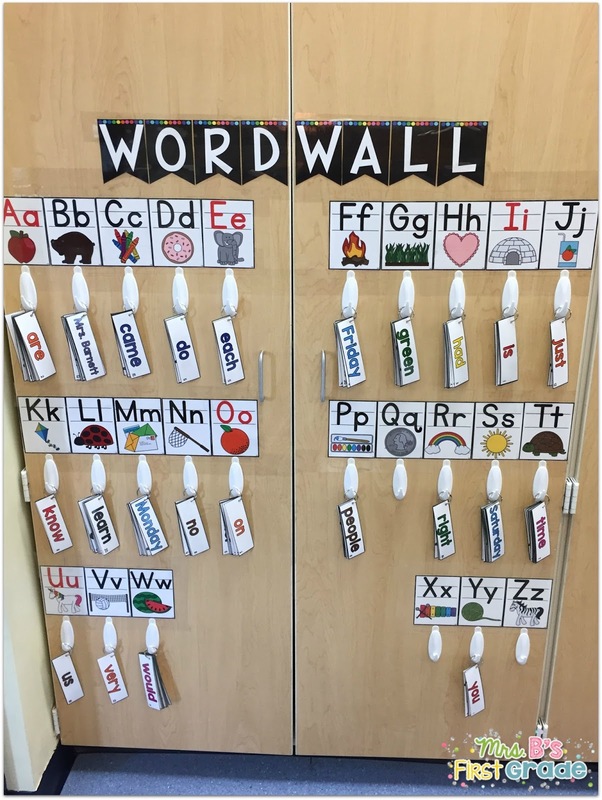 I wanted it to be a moveable word wall and more accessible for my kiddos. Part of doing that meant making my own word wall cards instead of using my other ones that I had pieced together from various products. I expect each of my first graders to know the first 200 Fry words. We access them at the beginning of the year to see what they know. Some of my kids know all 200. Some only know the first 10. 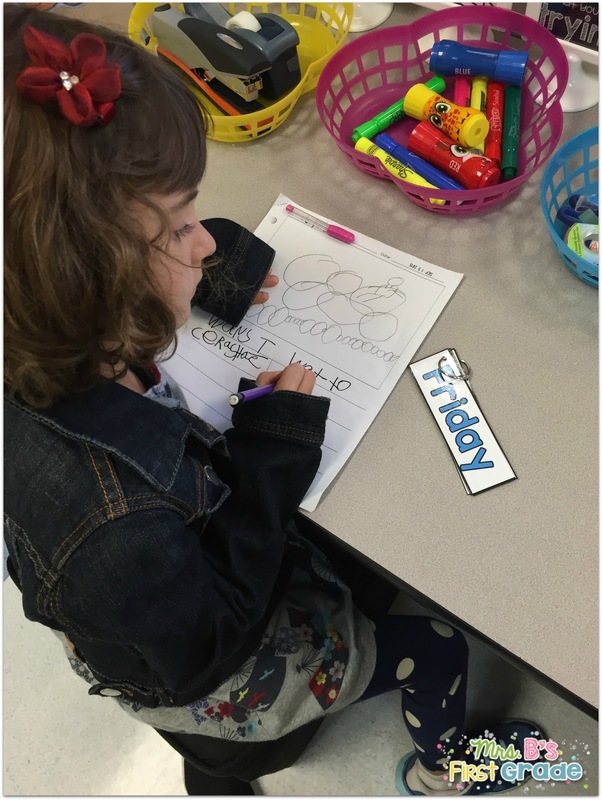 We break the list down into groups of ten and have the students practice learning ten at a time. I have created this product to reflect that. The cards are in groups of ten with numbers in the corner so that you can easily find what you need. There are also two versions - one that has the groups in different colors and one in black. I decided to put all the cards up on my wall at once this year. When my students are looking for a particular word, they determine the beginning letter and get that ring of cards. They either bring the ring back to where they are working, or they bring their paper with them to the word wall and write the word down there. It is working for me SO well! If you would like to enter to win, just leave me your name below. I will get in touch with the winner tomorrow! If you just can't wait, head to my store and check out the cards here! I have NO idea what happened! Thanks for leaving a comment, I am going to email you the product now! What an awesome pack! 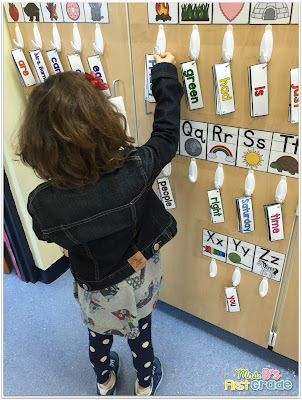 We love having resources around the room for our kiddos to grab when they need! This is such an amazing idea!